Vsl Security Services Pvt. Ltd. Chef is an open source technology developed by Opscode. Adam Jacob, co-founder of Opscode is known as the founder of Chef. This technology uses Ruby encoding to develop basic building blocks like recipe and cookbooks. Chef is used in infrastructure automation and helps in reducing manual and repetitive tasks for infrastructure management. 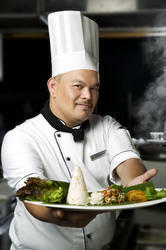 We need Pastry chef for Singapore, Salary 3000 $ - 4000 $. Visa can be expected by 25th October.